Arabian Nights is part of the progressive jackpot range of slots developed by NetEnt meaning the max possible jackpot is flexible but always a seriously big one. It’s cheap to spin with only 10 paylines and there’s the chance to win free spins as well as a sizable secondary jackpot. 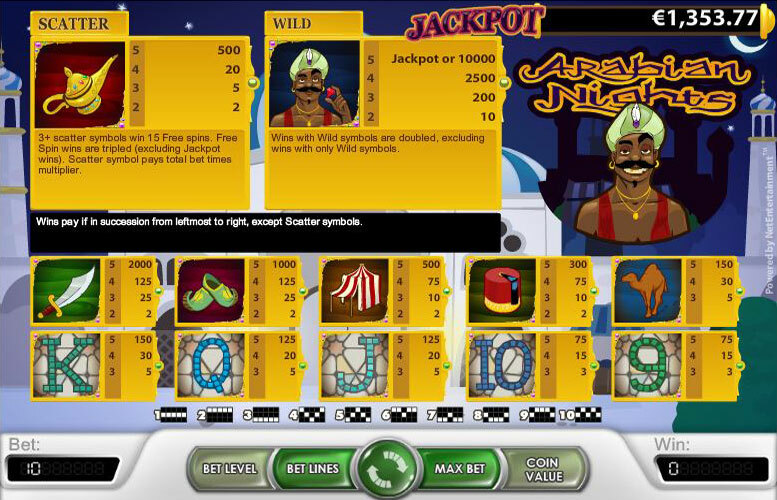 Arabian Nights is a 10-line slot game played on 5 reels. It is a game that is simple enough, both in play and in look but it’s livened up by a progressive jackpot! The background is night time, with an Arabic setting, and the background sound effects fit properly with the night setting, though not so well with the Arabic theme. There is the sound of cicadas and crickets and the occasional owl. This may annoy you after a while, but do not worry, there is a settings option for you to toggle the sounds off if you like. The music when you make certain combinations is good though. This slot has the auto-play feature that can do up to 1000 spins automatically and you can set it to stop based on certain criteria. Although you will see bet level and coin value on the left and right of the bet lines, spin button, and max bet respectively, they cannot be adjusted. Only the amount of paylines can. Now let us hide out in the bazaar and watch for whatever moves in these Arabian Nights. 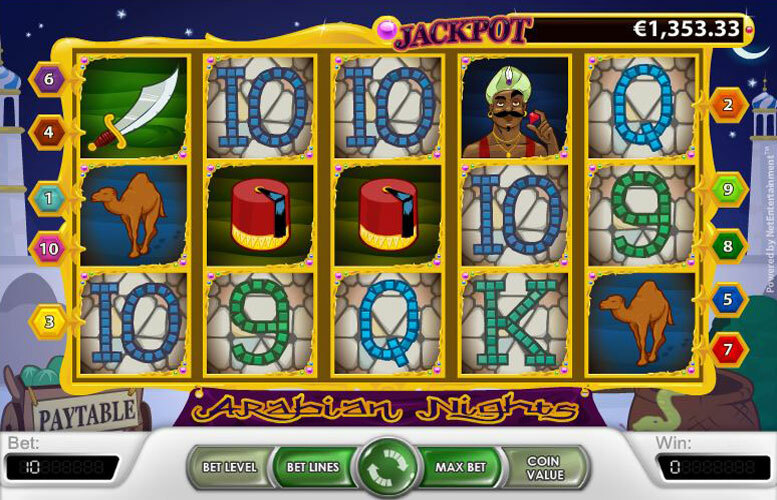 Arabian Nights does a progressive jackpot, and at the time of writing this review the current top prize is £482,429.87. The jackpot keeps rising based on players playing the game until it’s won so it’s only going to get bigger as whenever you spin a portion of your bet is added to the jackpot total. To have a chance at winning it, you have to get 5 wild symbols (these are pictures of an Arabian man holding up a red jewel). You will either get 10,000 or the jackpot. If you get less than 5, they will serve as wilds for making other combos on paylines, and double the wins wherever they are used. Now let us look at the rest of the paytable and betting limits. The betting limits are fairly low compared to other games, with 5 being the maximum at the rate of 0.50 per line times 10 lines. Thus, all wins in terms of coins are worth half in cash. A win of 200 coins will actually be worth £100 if you were playing in UK pounds. Unusually the bet level is automatically set at 1 and can not be adjusted and the coin value is set at 0.50 and again can not be adjusted. The only thing you can do to alter your bet amount per spin is play a different number of paylines. This makes the min bet per spin 0.50. Magic Lamp: this golden piece will get you 15 free spins if you get 3 or more. Each of those 15 free spins will triple any wins gained except for jackpot of course. Scimitar – 5 of these on a payline will get you 2000, while the minimum 2 will win you 2. Pointy Shoes – I don’t know the proper name of these shoes, but I do know that 5 of them on a payline will get you 1000, while the minimum 2 will get you 2. Tent – These red and white striped tents will win you 500 if you get 5 on any payline, while 2 is the minimum for a payout and will net you 2. Fez – This hat symbol will win you 300 if you get 5 of them on a payline, while 2 of them will win you 2, the same as the Scimitar, Pointy Shoes, and the Tent symbol. Camel- 5 of these Camels on a payline will win you 150, and it takes a minimum of 3 to get a payout, which is 5. King – 5 Kings will win you 150 like the Camel, and 3 will win you 5 like the Camel as well. Queen – 5 Queens on a payline will pay 125, while the minimum of 3 will pay out 5. Jack – The payouts for the Jack are identical to the Queen, with 5 netting 125, and the minimum of 3 netting 5. Ten – 5 Tens will win you 75 and 3 of them which is the minimum required for a payout, will get you 3. Nine – The payout values for 5 Nines is exactly the same as the Tens, with 75 being the prize for 5 of them, and the minimum 3 on a payline paying out 3. This game has a rating of 4 / 5 with 343 total reviews by the users.